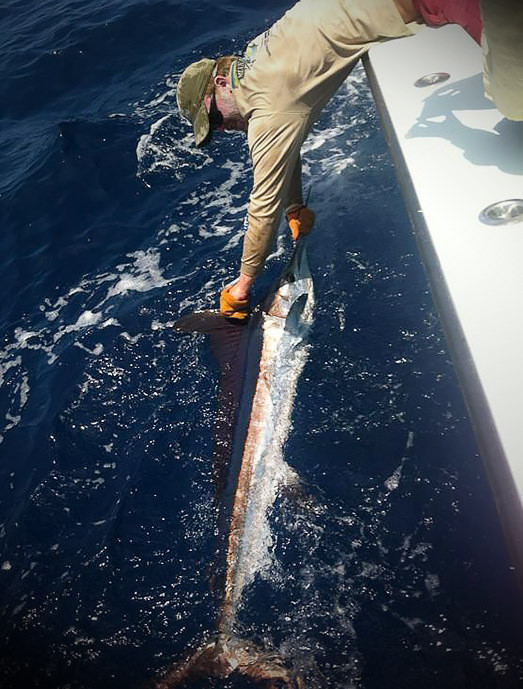 Get ready for a sport fishing fight when you book a trip to catch White Marlin with MGFC. Marlin are big and strong, and exhibit a will to put up a fight until the end. Whites are smaller than the blues, but catching a white is no less satisfying for any angler. Wanna experience white marlin fishing? When a Marlin is hooked, they usually make a dramatic leap from the water and soar through the air. This spectacle makes for great sights, and really gets the adrenaline pumping. 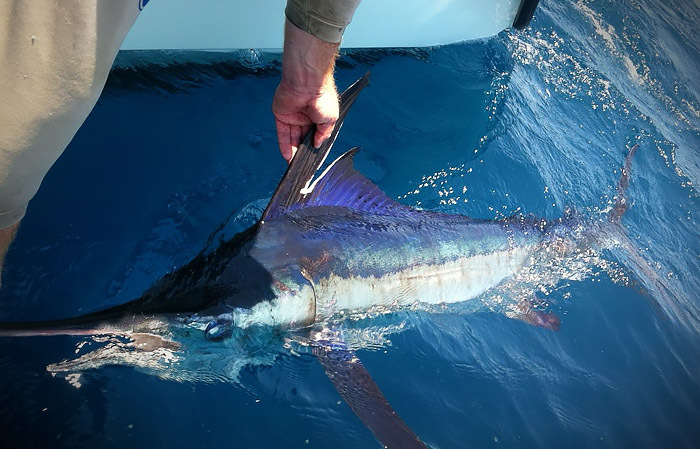 The great thing about catching Marlin with MGFC is that we’re all experienced captains and crew, who have hooked many and brought them to the boats. We catch them all summer, but the early fall (September is when they actually “school up”). Marlin like to be in deep water. When we take charters on Marlin trips, we usually travel between 30 and 100 miles offshore. It’s in that range that you’ll spot the fish near the water surface as they swim around weed lines. Weights average from 40 to 70 pounds, but some do come in larger than that. Largest to about 180. Fishing for Marlin can be done with either lures or live bait while trolling or drifting. White Marlins roam the open sea like the Blues, but can often be found within the continental shelf. 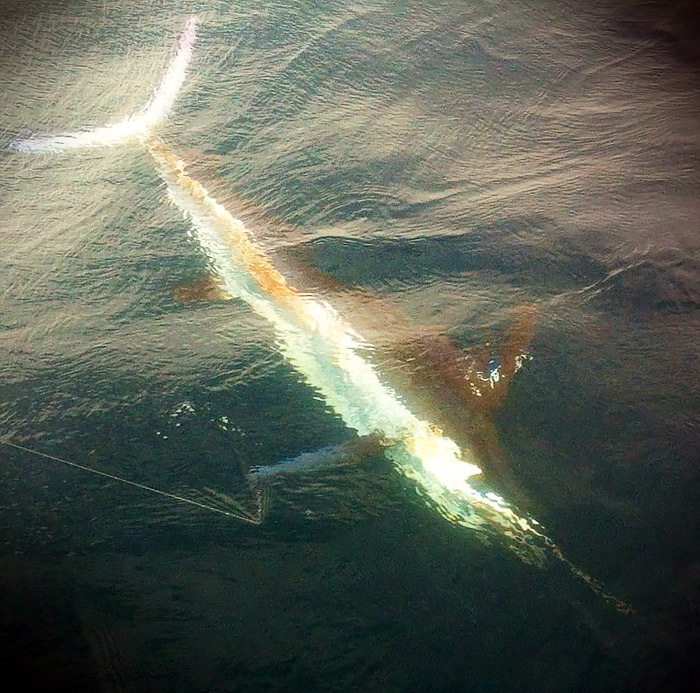 At MGFC we use a variety of fishing techniques to catch White Marlin. We have four fast and comfy catamarans that will get you quickly and safely to the optimal waters for this species, and note: this is strictly a catch and release fish. 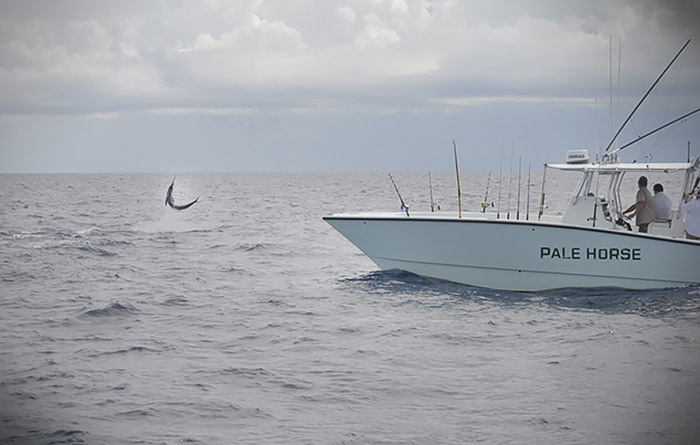 Whether you’re an experienced White Marlin angler, or a first timer, give us a call. Let’s catch some White Marlin with MGFC!